Focused on the link between clocks and finding one’s location, the exhibit begins with the challenge of finding longitude and the race between nations to enhance their sea power by developing ocean-going timepieces. It traces the tales of early aviators, World War II navigators, and the Apollo astronauts through to the inventors who made navigation easy with the development of Loran and then GPS. The exhibit, which was jointly developed by Air and Space and the Smithson’s National Museum of America History, features a number of notable items including the earliest sea-going marine chronometer made in the United States, a device produced by Bostonian William Cranch Bond during the War of 1812. Carlene Stephens, one of the exhibit’s four curators, described Bond as the Forrest Gump of his era. “He shows up at every important time-related event in the first half of the 19th century,” she says. In addition to developing a chronometer, said Stephens, Bond established a business to provide devices for time keepers, participated in various expeditions and became the first director of the Harvard College’s observatory where his astronomical observations contributed to navigation tables. Around the corner from Bond’s chronometer is the clock used by Charles Lindbergh during his milestone transatlantic flight in the Spirit of St. Louis and the Winnie Mae, the airplane Wiley Post flew in his record-breaking flights around the world in 1931 and 1933. In the center of the exhibit is Stanley, a robotic vehicle able to drive and navigate itself. Developed by Stanford University’s Stanford Racing Team in cooperation with the Volkswagen Electronics Research Laboratory, Stanley won the $2 million DARPA Grand Challenge in 2005 after successfully traversing a 150 mile course. 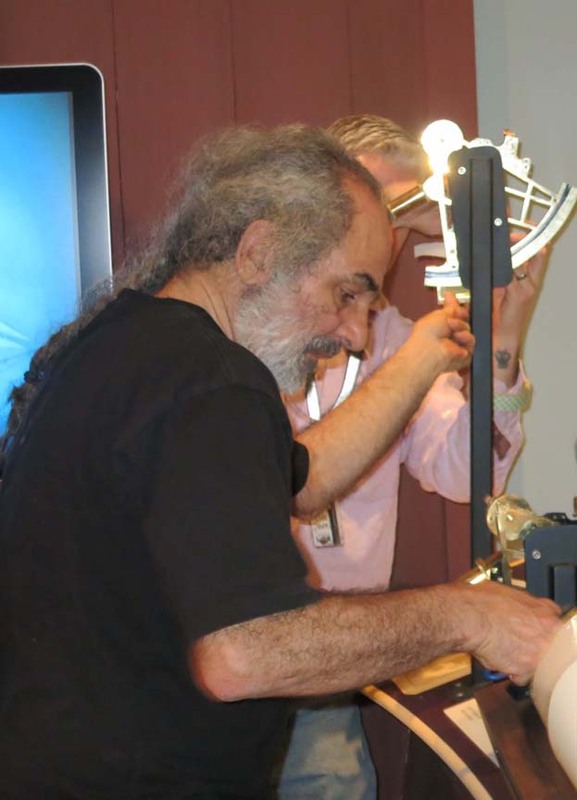 The exhibit sprang from a suggestion by Demetrios Matsakis, the head of the Time Service Department at Naval Research Laboratory, to commemorate the anniversary of the publication of Einstein’s "Special Theory of Relativity." “He suggested to me in early 2004 that wouldn’t it be a great idea to have for Einstein’s 100th anniversary in 2005 an exhibit about the relationship of clocks and GPS because GPS is one of the few things in everyday life that has to take into account the theory of relativity,” Stephens told Inside GNSS. Development of a three-case exhibition at American History, where Stephens is based, won approval — but then it became clear the building would be closed for renovation at the time the exhibition needed to be on display. Stephens got permission to find another venue, resulting in the much larger, joint effort. More recent history is reflected as well. A panel titled “Satellite Systems in Jeopardy?” notes some of the threats to satellite navigation, including jamming and the danger of being overwhelmed by communication signals from other nearby frequencies. The recent fight between LightSquared and the GPS community helped spark support for the display. “People are much more attuned to what is going in Washington D.C.,” said Johnston. The exhibit, which is expected to be in place for at least five years, is sponsored by Northrop Grumman Corporation, ITT Exelis, Honeywell, the National Geospatial-Intelligence Agency, the U.S. Department of Transportation, Magellan, Rockwell Collins, the Institute of Navigation, and the National Coordination Office for Space-Based Positioning, Navigation & Timing.